Tasted in a lowball bourbon glass, poured straight. Nose: Dominant Tobacco shoppe, as though I’ve walked in to select the right one for an evening of smoking a pipe but wavering between several that all call my name to draw me in for a deeper sniff. Once I go in closer, I smell a fresh zesty citrus with undertones of cinnamon and allspice. Taste: Between a cherry and citrus tobacco, orange zest strikes before a warm swallow. This sample is barrel proof of 57%- 58% alcohol by volume, so I’m getting a warm breath of spices that gives a Christmas mouth feel. Imagine a long evening walk up a snowy hill on your way to a cabin where Four Roses Master Distiller Jim Rutledge greets you with a glass of what seems to be pure liquid Christmas. No fluff in this amber to convince you of the festive flavor of Mariage, its just there; pure, straightforward. With the same straightforward approach to bourbon making, I’m seeing Jim Rutledge lifting toast in this brief daydream of flavor analogy. Finish:There is delightfully tight dryness on the finish. 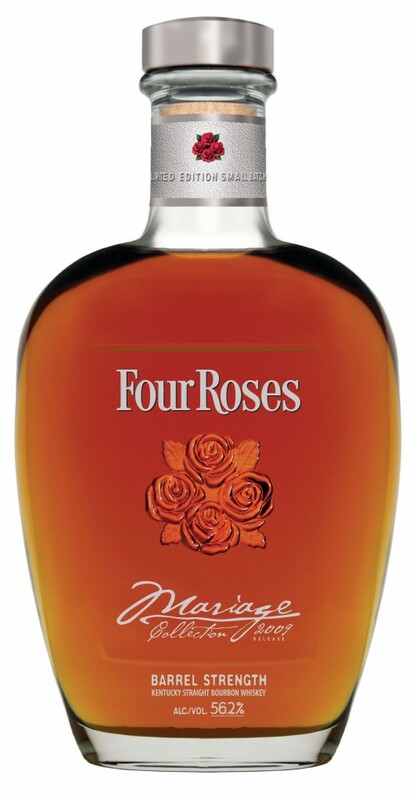 A few swallows will keep you pouring the Four Roses Mariage Collection 2009 Release all evening long. Now sampling this bourbon on the rocks, more cherry notes. The clarity of citrus and fruit comes to greater heights alongside the tobacco.